If the gutters on your home are in need of some repair, you may be wondering if it’s worth the cost. After all, rainwater isn’t going to hurt anything, right? Unfortunately, a “little rain” can do a lot of damage over time which is why any gutter repair Fairfax VA is so important. A lot of people don’t understand why gutters are so important and what exactly they do for a home which can cause a lot of problems. Having gutters on your home isn’t enough. You need to make sure that they were properly installed and maintained in order to make sure that they are as effective as possible. Every home needs gutters and some cities are starting to require them in order for a building to keep up with code. Gutters are important because they can save your home from structural issues and other damage. When rainwater is not properly diverted away from the home it can cause problems around the foundation. This can decrease the stability of your home in a significant way over time. Flooding is also a potential issue that can be prevented by installing and maintaining your gutters. Flooding not only can damage the items in your home, but it can also lead to health problems from the growth of mold. Over time, your siding or bricks can also be damaged or stained by rainwater. Aside from your home itself, rainwater can cause a lot of issues on the rest of your property. Your driveway, sidewalk, or patio could end up with cracks from the soil underneath constantly having to resettle after flooding. The water could also erode away at your landscape if not redirected away. Proper gutters on your home can ensure that the soil on your property is stable. 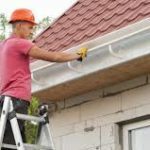 While rain gutters are important, they do require work to make sure that they stay in working order. If you have gutters on your home, there is a good chance that you are not cleaning them out as much as you should be. After all, it’s not like you can usually see just how much dirt and debris have built up in them unless you get on a ladder and look yourself. If you are scooping out handfuls of leaves and dirt, you are not cleaning them as often as you should be. Fortunately, there are screens that can be installed to prevent the quick buildup of leaves and dirt in your gutters. 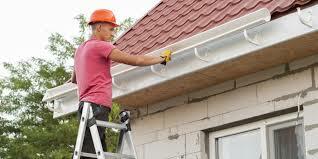 There are a lot of problems that can come with improperly maintained gutters. Over time, the weight of the leaves and dirt can cause the gutters to fall off and damage your home. In addition, standing water is perfect for the breeding of mosquitos and other unpleasant pests. You may also have to deal with water leaking into your house through the walls which can lead to a host of problems in and of itself that could lead to electrical fires or buckling walls.